At the end of last year, a penthouse in the new One57 tower sold for an astounding $100M, setting a new record for most expensive apartment ever sold in New York City, and topping a banner year for high-end real estate that included seven sales valued at over $50 million. Are these sales reflective of a luxury bubble that is about to pop? In 2000, when Blackstone president Steven Schwartzman bought a Park Avenue triplex penthouse for $37M, people could not imagine how prices could go any higher. Sure enough, it took only one year for the sale to be topped, as Donald Trump sold his Trump World Tower penthouse for $38M in 2001. For as long as I can remember, people have regarded the prices of New York City’s ultra-high-end apartments as absurd. And of course, the prices have always managed to climb higher. Is this recent boom in luxury real estate somehow different? How much higher could the ceiling be? The sales in this list span nine years, going as far back as 2003. Yet, the prices have a fairly tight range, with only $12 million separating #1 from #10. At this point, you could easily argue that $40 to $50 million is reaching the limit of New York’s ultra-high-end condo market. But today, only three years later, the landscape is completely different. Since the start of 2012, the high-water mark for real estate in NYC has nearly doubled, leaping from $52M up to $100M. And this $100M sale is not so easy to write off as an outlier. 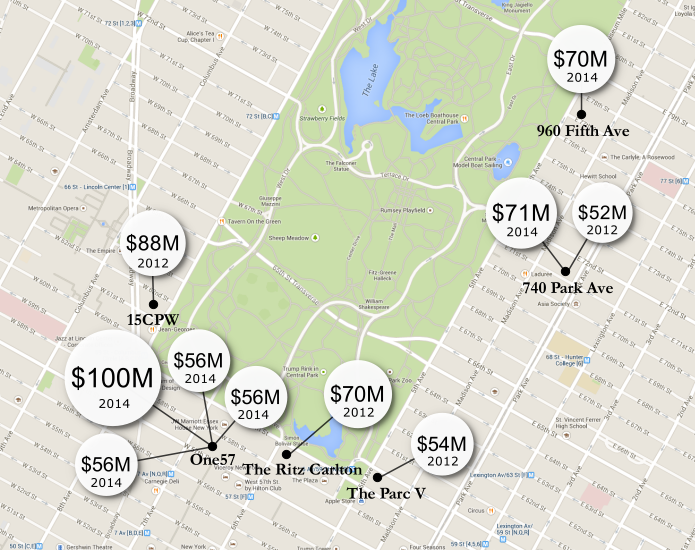 Since 2012, nine other apartments have also topped the prior record of $52 million. Only three years later, not a single apartment sold before 2012 remains on the list. 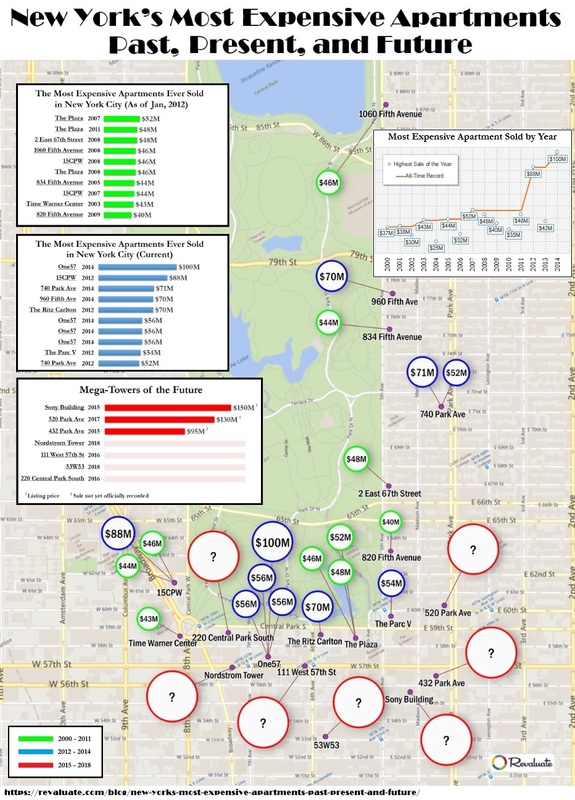 Six new ultra-high-end residential towers are set to go up over the next four years, and each of them is likely to match or even surpass the $100M mark set by One57. 432 Park Avenue, set to open later this year, is already the tallest residential building in the Western hemisphere at 1,400 feet. One of its units has already sold for $90M, though the sale has yet to be officially recorded. 111 West 57th Street and 220 Central Park South, are scheduled for completion in 2016. Built in the same tall, skinny mold as One57, they have planned heights of 1,421 feet and 950 feet respectively. 520 Park Avenue is set to open in 2017, with units going on sale beginning early this year. The developer, Arthur Zeckendorf, has already stated that the building’s penthouse will be listed at a price of $130M. 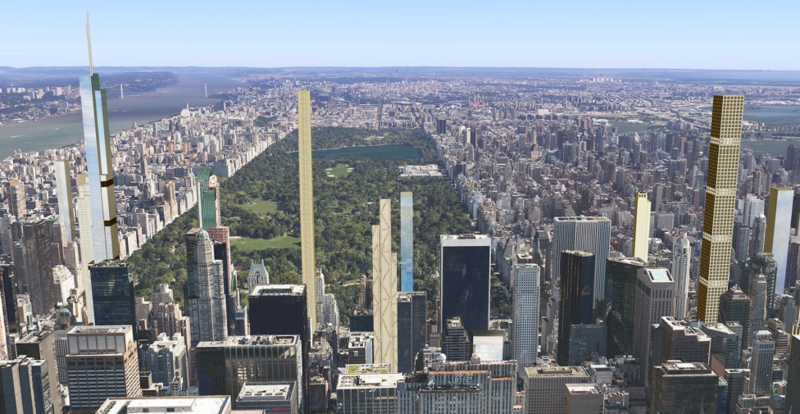 In 2018, 53W53 and the Nordstrom Tower will round out the batch. The Nordstrom Tower, which has a planned height of 1,775 feet, would become the fifth tallest building in the world and the second tallest in the U.S., standing only a foot shorter than One World Trade Center, including the spire. In addition to these new towers, several already-existing commercial buildings are joining the ultra-high-end mix and converting into condominiums. Only a week ago, the Sony Building at 550 Madison Avenue released an offering plan in which its triplex penthouse was listed at a record-shattering $150 million. It is hard to imagine where the demand for so many $10M-plus apartments could come from. There cannot be many people in the world who are even capable of spending that much, let alone those who think it is a good use of money and want to live in New York. On the other hand, money speaks louder than words, and some of the smartest developers in the world are betting billions that prices will go even higher. Trulia “Pro Tip” Mystery Solved! 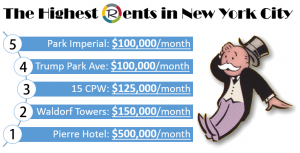 Previous story When is the Best Time to Rent an Apartment in NYC?